​ST JOHN’S, Antigua, CMC – Resurgent left-hander Kieran Powell has revealed that an “inspirational” conversation with sacked former West Indies coach Phil Simmons, helped convince him to make a return to competitive cricket. The 26-year-old Powell took a self-imposed two-year break from the game, only returning towards the end of last year’s first class season. During the time away, Powell unsuccessfully tried his hand at American baseball, trying out with the New York Mets and the Milwaukee Brewers. However, Powell said he was determined to return to cricket especially was after Simmons initiated contact. “I did a bit of baseball, started some businesses but there was one day when I received an email from Phil Simmons stating that he would love to have a chat with me,” Powell told Massy Insurance Line and Length Network. “We exchanged numbers by email and then we spoke and he said he would be really interested in having me come back into cricket and West Indies cricket. 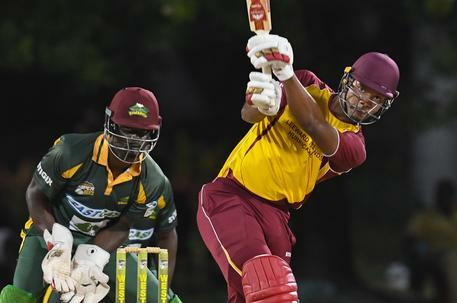 In his first regional first class innings after abruptly walking away from the game in 2014, Powell hit a cameo 55 for Leeward Islands Hurricanes against Guyana Jaguars in their penultimate game of the season at the Vivian Richards Cricket Stadium last March. He scored 33 and eight in the final game against Barbados Pride and gained selection for the West Indies A tour of Sri Lanka last November where he had modest returns with 119 runs from six innings in the three-match four-day “Test” series. Ironically, Trinidadian Simmons was abruptly sacked two months prior for what the West Indies Cricket Board described as “differences in culture and strategic approach”. Powell hinted at form during the first half of the current first class season but the runs finally came during the ongoing Regional Super50 where he has already plundered over 500 runs with three centuries and two half-centuries. The Nevisian said a combination of factors were behind his run of form in the tournament. “I’ve been putting in lots of hard work, [working on my] physical fitness as well, working with my coaches, being more mature, being settled in marriage – that helps me as well to just go out and play my natural game,” Powell explained. “My wife supports me a lot which is bonus. It helps me to go out and play my style. Also the team environment is just conducive to the guys going out and expressing themselves with no fear of failure. Powell, who has scored just under 1100 runs in 21 Tests and nearly 800 in 28 One-Day Internationals, was once viewed as a long term solution to the West Indies opening woes. And with that problem still not solved, Powell’s form is likely to propel him into contention, with England, Afghanistan and Pakistan all expected to tour the Caribbean this year. However, Powell said his major focus at the moment was on leading Hurricanes to the capture of the Regional Super50, and not on West Indies selection. “I try and control what is controllable for me. I’m just trying to put my best foot forward. Obviously I try and bat every game as if I haven’t scored a run in the tournament which is my incentive and motivation to go out and get big scores every game,” he stressed.